If you are at an AC/DC concert and you yearn to hear Brian Johnson yell FIYAH, most everyone cheers and continues to rock-on. Hearing someone yell fire while in a racecar, however, means you could be at the start of a very bad day. In most off-road race vehicles, it’s imperative to have some kind of fire suppression system. Manufacturers such as Safecraft Safety Systems, owned by CLP Motorsports, makes fire suppression systems for cars, boats, aircraft and more. The company has become an industry leader for fire suppression systems for motorsports, and off-road racing. 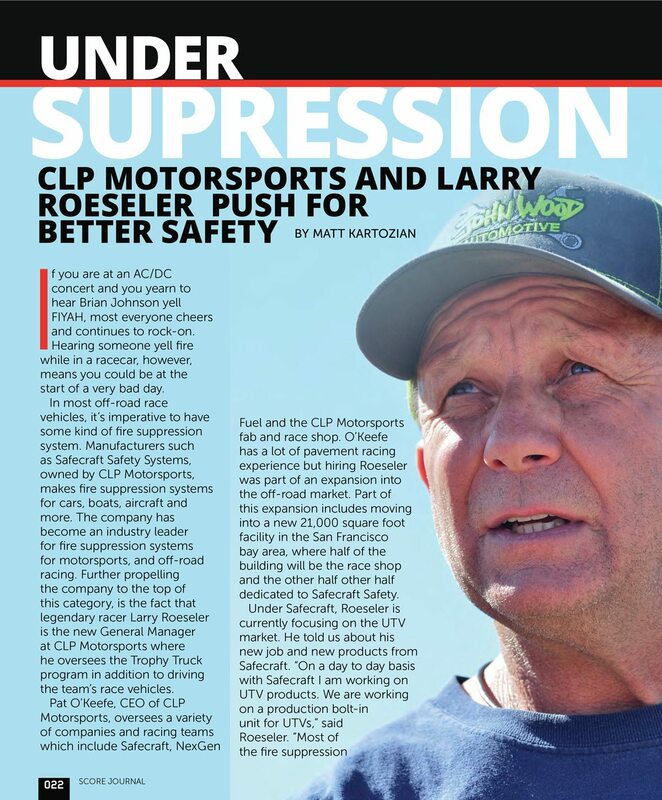 Further propelling the company to the top of this category, is the fact that legendary racer Larry Roeseler is the new General Manager at CLP Motorsports where he oversees the Trophy Truck program in addition to driving the team’s race vehicles. Pat O’Keefe, CEO of CLP Motorsports, oversees a variety of companies and racing teams which include Safecraft, NexGen Fuel and the CLP Motorsports fab and race shop. O’Keefe has a lot of pavement racing experience but hiring Roeseler was part of an expansion into the off-road market. Part of this expansion includes moving into a new 21,000 square foot faciliy in the San Franciscion bay area, where half of the building will be the race shop and the other half dedicated to Safecraft Safety.